My name is Carlo, I’m from Canada, and I’m in my early thirties. I started developing rules and getting into RPGs during elementary. This was because I was too young to learn and fully understand the actual rules for games like Advanced Heroquest, so I’d just make them up instead. I eventually got in to D&D, as well as Battletech, Car Wars, Warhammer 40,000, Silent Death, Android Netrunner, etc. I’ve continued the hobby into adulthood, even if I have more rulesets than I’d ever play, and more figures than I could ever paint. For a while I was starting to develop fairly realistic rulesets, at the cost of needless complexity. Then after playing a few mainstream board games, I decided to try my hand at a simpler game. Now I’m trying to merge the “easy to learn” element with the “boy, that was a great simulation!”, and have created Dinosaur Cowboys as a result. The game returns to my roots of fast paced combat, some fun dice rolling (my favorite of D12s), and customizable posses to allow players to skirmish head to head in under an hour. The appeal of dinosaurs is fairly global, as numerous comic books and novels (and even the rare movie) has shown. The basic idea for the game came to me when I thought “Hey, a wild west story could be fun, but instead of horses everyone rides dinosaurs!” Inspired and always eager to craft more rules, I started brainstorming ideas. Eventually after much testing, editing, and reworks I finished the v1.0 release of the rules. After a further two years of playing the game, I slowly tweaked it enough to warrant v2.0. You can always grab the latest rules from here. To get an idea of what is important or interesting to read on the blog, or to see inspirational movies, stories, and images concerning dinosaurs, check out the What to Read section. There are also Forums to post comments and session reports and meet other players. And if you’re having trouble designing a Posse with pen-and-paper be sure to check out The Saloon online posse designer. I’m always interested to hear of battle reports using the rules, or any ideas, questions, or feedback! You can comment here or email me at carlo@dinosaurcowboys.com. 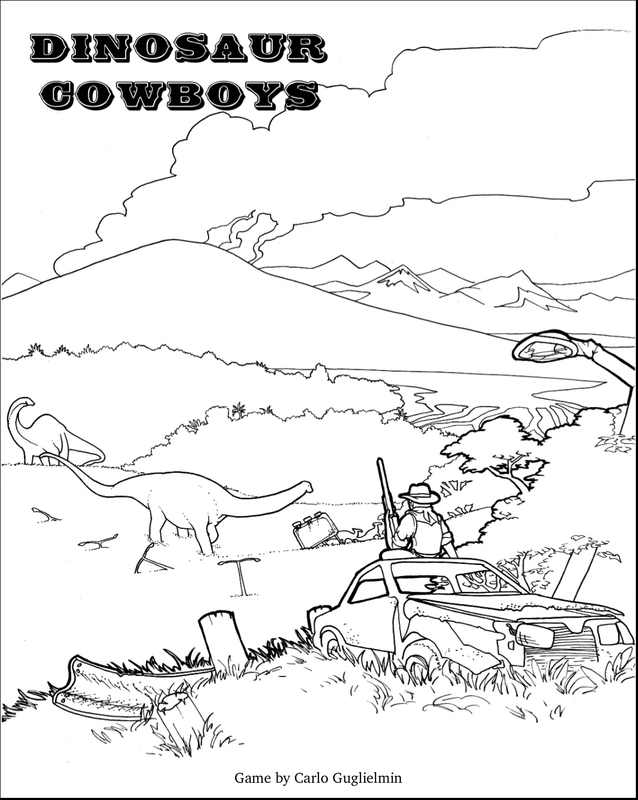 I love the idea of a Dinosaurs and Cowboys themed game. There’s just something about it that strikes a chord with any man with hair on his chest. Then you throw lasers into the mix and you know you have a good recipe! I salute you. Yes, this is a fantastic idea for a game! If I may be so bold as to suggest adding some cool visuals to your site–I think that would really create some interest for your game. Great setting and game idea, especially as toy dinos are so cheap. The rules look good. As my post apocalyptic game setting has dinos I will be giving these rules a go when time allows. I hope you mind but I put a link up to your rules on the Post Apocalyptic wargames forum as some of those guys may like your setting/rules. Also as I am the moderator over there, please feel free to post up any game reports or updates. Thanks for the compliment, I’m really happy with how the game is shaping up. Do you have a link to the forum you posted it on, maybe I can register there and chat with people. I appreciate the note though as I’m always happy to get more interest in Dinosaur Cowboys churned up! This sounds like an awesome idea for a game. I’ll be reading through these rules shortly. Glad that you like it! Definitely give the rules a look and let me know what you think, as I’m always up for feedback. Hello, I am curious about this game. The objective is to kill dinosaurs or kill posses? Also I got confused by the maps posted in this page. What are the meaning of all that building, coins and building? By the way, Would you mind make a video of how to play it? It looks fun but confusing, I love boardgames and I want to try this one. Hi Rogner, thanks for the interest. The game has two or more posses fighting each other, and each posse can have their own dinosaur as a “gang member”. The simplest objective is to just kill off the other posse, but other objectives (like capturing a point) can be chosen. Also keep in mind this is more of a tabletop wargame than a traditional boardgame, as in you’ll need to make the play space of terrain yourself, as compared to getting all the components in a single box. If you find the content here a bit confusing don’t worry, there is a set of Quickdraw Rules that has all the posse design and choices made for you. You can find these under the Rules page. I don’t have a video of gameplay, although eventually I’d love to make one. There are many written reports of games at least which could help, found under Game Sessions. I hope you can! I certainly enjoy the game, even if I’m biased towards it. Let me know if you run into any issues or have questions. I really like the look of your Primal Frontier story collection. 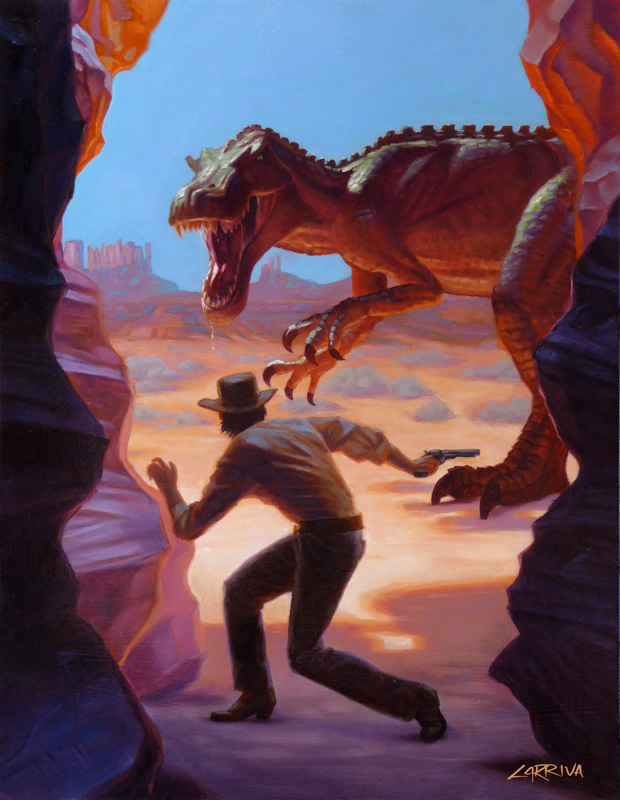 I did a few short stories for the Dinosaur Cowboys universe for Nanowrimo, although clearly not at the same level or quality (https://dinosaurcowboys.com/category/fiction/). I’ll make a note to do a feature blog post in the future on your work, if you don’t mind, since it fits in perfectly with what I write about here! btw I like your post on “which gun for dinosaur hunting”. In this game I’ve styled lever-actions to be long range focused (although I do love my real life Browning BL-22 plinker), and have the “Bronto Gun” be more of a dedicated dinosaur hunter (think of it like an 500 Nitro Express Elephant Gun of old). Nice to see we’re on a similar page though! Also like I said in the post, if you get a plain PDF or non-Kindle version (like an epub or something) available I’d buy it.